In just a few weeks, Britain goes to the polls to vote in a new government. 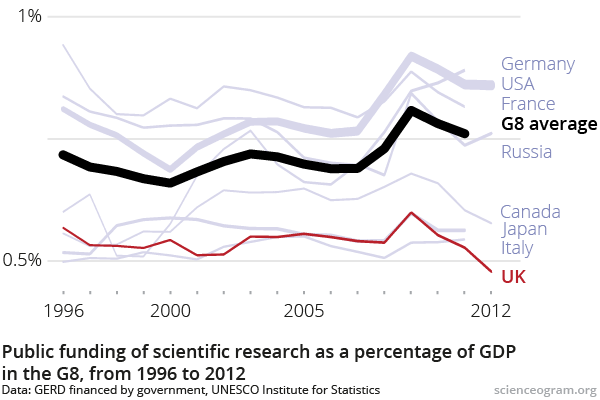 This is obviously a crucial time for science funding and policy. That is why Science Is Vital needs you to contact your MP or parliamentary candidate. Public science funding has dropped below 0.5% of GDP. The lowest amongst the G8. Since 2010, the science budget, despite having been protected from the worst of the austerity measures, will nevertheless have depreciated in real terms by up to 20%. In fact, it has now dropped below 0.5% of GDP for the first time in 20 years. If we don’t act now, it could take generations to recover. In parallel, near-sighted policies on immigration, and inaction on the precariousness of the scientific career structure, threaten the day-to-day business of science, and those who depend on it. 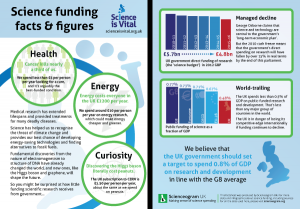 Since 2013 Science is Vital has been campaigning to get the UK to increase the science budget to the G8 average of 0.8% of GDP. Use this Factsheet to build your case for increasing science funding. 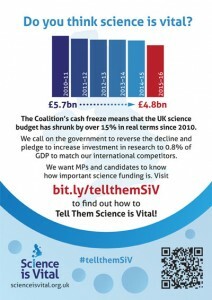 To coincide with British Science Week, Science is Vital is organizing “Tell Them Science is Vital”. During this week, tell everyone you know—your colleagues, your friends and family, your social media contacts—to write to their MP and parliamentary candidates. Writing to your MP is one of the most powerful things you can do as a citizen. MPs take letters from their constituents very seriously, especially if they concern local issues and arrive in great numbers! Old-fashioned written letters are said to be somewhat more effective than emails, but emails are good enough if that’s all the time you have. There are around 400,000 researchers in the UK. There are 850,000 dementia sufferers. Imagine if they and their families all wrote to their MP. What should I say to my MP/candidate? Tell a story; share your passion! It would be great if you could let us know what you said by copying and pasting your letter in the comments below, or by cc’ing any emails to mps@scienceisvital.org.uk. You could also tweet with the hashtag #TellThemSiV. You can also reach the House of Commons switchboard on 020 7219 3000. Note that Dissolution of Parliament will occur on 30 March 2015: after then there will be no MPs until after the election, and you will have to write to your parliamentary candidates. Enter your postcode at yournextmp.org.uk to get an up-to-date list of candidates in your constituency. The campaigning leaflets that come through your letterbox will also tell you how to get in touch with parliamentary candidates. The Campaign for Science and Engineering (CaSE) is already asking parliamentary candidates how they would support science and engineering if elected. Check out responses on the CaSE website. Yes! If you have time, you could go along to one of your MP’s surgeries. These should be regular events, and will give you the opportunity to grill them in person. Don’t forget to quiz candidates on their attitude towards science when they come knocking! And last but not least, we’re relying on you to spread the word. Contact your friends, colleagues and random strangers with a link to this page! Have a letter-writing party – whatever it takes! Without Science – we would NOT have Health cures, Robots in factories to do “dangerous to humans” jobs, robotic lumbs, LAND ON A COMET to find origin of Life (to aid future cures) . We need to finbd a way for future humans to evacuate Earth when our sun becomes a Red giant.